1974. In a few sentences, the polish geneticist, Waclaw Szybalski, laid the foundations of the Synthetic Biology. Following the development of biology molecular and the discover of the enzyme of restriction, he thought that one day, it would be possible to build some new genomes, or parts of genomes. “Let me now comment on the question "what next". Up to now we are working on the descriptive phase of molecular biology. 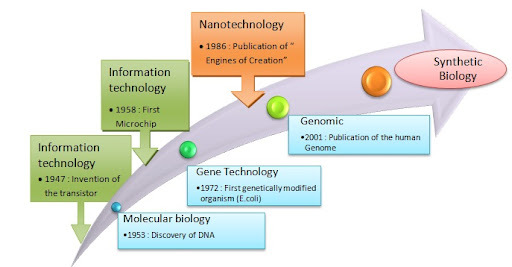 (...) But the real challenge will start when we enter the synthetic biology phase of research in our field. We will then devise new control elements and add these new modules to the existing genomes or build up wholly new genomes. This would be a field with the unlimited expansion potential and hardly any limitations to building "new better control circuits" and(...)finally other "synthetic" organisms, like a "new better mouse". (...) I am not concerned that we will run out of exciting and novel ideas (...) in the synthetic biology, in general”. Nowadays, Hugh Whittall, Director of the Nuffield Council on Bioethics, describes Synthetic Biology as “the construction of novel biological networks/organisms with bespoke properties, using standardized biological parts that code for known functions”. These parts can be extracting from existing organisms or be the results of a chemical synthesis after an artificial design. The SynBio can be divided in two approaches: top-down and Bottom-up. The first one consists in starting from a whole organism, and then reducing its genome until it can only provide a specific function. The second one is the opposite: you create an organism just with biobricks (system developed by the MIT). You just add to the organism’s genome the genes that bring it the function of interest. Three methods have been developed in this frame: minimal genome, artificial cells and synthetic biomolecules. It is obvious that without IT, there is no gene bank, no international access to information, which are the two main skills that increased the speed of progress in SynBio… One of the innovations in SynBio is the multidisciplinary workforce. Because of the large aspects of application and the implication in the creation of an artificial life, SynBio workforce needs biologists, engineers, chemists, IT specialists, social, ethical and economic experts. This is an important asset that proves the impact that SynBio can have on the scientific world. But this underlines that creating life and controlling it is a huge and difficult power that needs the contribution of all the scientists’ communities. The domains of application are almost unlimited, because the objective is to create synthetic life, with various aims.